Coleraine battled back from a goal down and a man down to earn a deserved share of the spoils against Glentoran. The Bannsiders fell behind to a first half Robbie McDaid header before they had Eoin Bradley sent off for dissent as the teams left the field at half time. But they came out rejuvenated in the second half and drew level on 51 minutes after another special Darren McCauley strike. The hosts had the better of the second half despite being a man light, but they couldn't find a winner. The visitors should have been in front inside two minutes as Connor Pepper picked out Marcus Kane in the box, but he could only direct his header over the bar from close range. The Glens edged in front on 25 minutes as McDaid glanced home from Ross Redman's free kick. Coleraine began to find their feet with Bradley and Josh Carson trying their luck, but without really threatening Elliott Morris. Bradley was becoming embroiled in a running battle with Calum Birney. The Bannsiders striker was becoming increasingly frustrated as he felt decisions weren't going his way. As the teams left the pitch for half time Bradley was shown the red card by referee Evan Boyce for something he said to the official. Coleraine changed their shape for the second half, and it bore dividends inside six minutes. Carson fed McCauley, who glided past two players before firing past Morris to level things up. 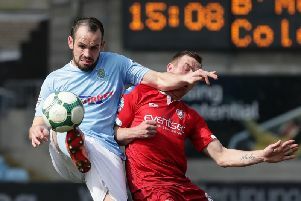 A whipped ball into the box on 72 minutes by Carson was flicked on by Gareth McConaghie, but his defensive partner Stephen O'Donnell just failed to make contact with it at the back post. Coleraine went close again six minutes later as Carson picked up the ball on the edge of the box before unleashing a shot which beat Morris but dipped too late as it dropped over the bar. Calum Birney then produced a vital block to deny Harkin with two minutes to go. Seconds later Morris got enough on McCauley's cross to deflect it away from the onrushing Carson, who was waiting to pounce for what would have been the winner.